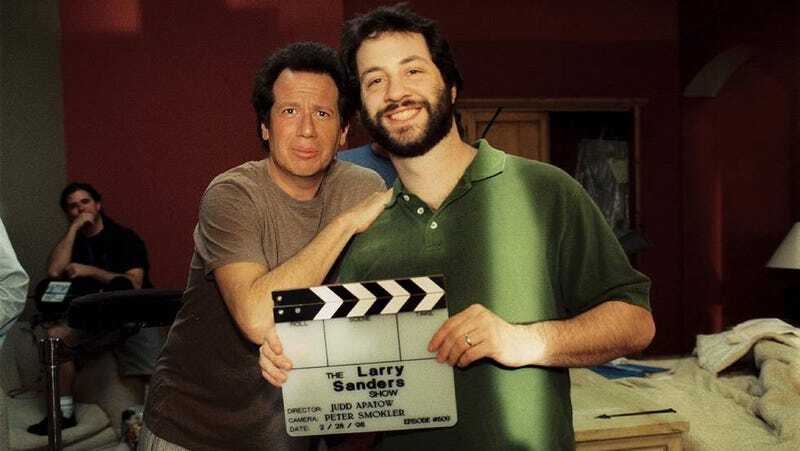 Early in the first part of The Zen Diaries Of Garry Shandling, director Judd Apatow mentions how he had a habit—even before Shandling died—of reminding people that “most of modern comedy originated with Garry, that he inspired so many people.” Apatow’s two-part documentary about his friend and mentor spends more than four hours making a convincing case for the late comedian-actor, who died of a heart attack in 2016. Shandling made his name as a stand-up in the ’70s and ’80s, but found his greatest fame and creative peak on television, first with the meta It’s Garry Shandling’s Show and, most important, with The Larry Sanders Show, which remains one of the most groundbreaking TV series of all time. Shandling ended the show in 1998 and spent much of the succeeding 18 years keeping a low profile, even among people who knew him best. The Zen Diaries Of Garry Shandling, which debuts March 26th at 7 p.m. Central time, uncovers much of the mystery around its subject thanks to his nearly 40 years of journals, copious interviews, home movies, and the testimony of the people who spent a lot of time with him. As Apatow told The A.V. Club ahead of the documentary’s debut, it didn’t so much bring closure as amplify the feelings he already had. The A.V. Club: In the doc you say, “He taught me how to write. He taught me how to direct. For 25 years, he was the most important mentor that I had. And he was always there for me, personally professionally, but in a lot of ways, he was a mystery to me.” How was he mysterious to you? Judd Apatow: Garry was somebody who was so interesting and so funny. He was just a unique personality. He always had a lot on his mind, he really overthought everything, and you sense that there was some root to his pain and his hyper-vigilance. But you were never sure what it was. A lot of people would say, “How’s Garry doing?” And even Garry would be like, “What do you tell people when they ask how I’m doing?” And he would say to me, “How do you think I’m doing?” In a way the movie attempts to answer those questions and let people know what forms him and what was going on in his mind—because we have these journals, so we know what he was thinking about. AVC: How much did the journals shed light on the mysterious parts of him? JA: I feel like it revealed almost everything. The journals covered his entire life since 1977, and he certainly was very open when speaking with himself. So, that’s what is great about this documentary. A lot of times in a documentary, a lot people are guessing about what someone was thinking, and here we just specifically know. AVC: Did anything in there surprise you? JA: I’m not sure anything surprised me other than I was surprised that he was ruminating so much on how to be a kinder person, how to be more connected to people, how to love better and how to drop his ego. Things like that a lot. But it was interesting to climb into his mind and see how he thought about it when he was alone. What was really captivating was the journal entries from when he was first learning how to do stand-up comedy and how he approached it from a Zen Buddhist point of view. So much of it was about learning to trust himself, and finding ways of figuring out how to not have stage fright, so the real Garry could be up there on that stage. It was all about stripping away artifice so he could be truthful up there. He attempted to do that by writing a lot, and trying to dissect what happens on stage and how he can be fully present and alive up there. AVC: What was incredible to me is that he seemed to figure it out really quickly. The old adage, that it takes you seven years to find you voice doing stand-up. In one entry he says, “No one cares, no one realizes, they want to hear Elvis. So it is with material. It doesn’t matter if it’s like someone else’s. It is merely a vehicle to be Garry. The more you are Garry and the less you worry about the song you’re singing, the more you’ll be yourself.” That was so perceptive for a young comic to already figure out how much depends on going up there and being yourself. JA: I think he started doing stand-up very seriously around 1977—he had been doing it more part-time while trying to be a writer before then. And in 1981 he was on The Tonight Show and had broken through in a big way, and in 1983 he was hosting The Tonight Show. In seven years he didn’t just find his voice, he was the host of The Tonight Show. It was really remarkable. You can tell that he’s read books like Zen In The Art Of Archery and is applying those ideas to stand-up comedy. So much of what he writes about is letting go and trusting that, if he does, his humor will appear. There’s a great entry where he’s about to go on The Tonight Show and do panel with Johnny Carson, and he’s trying to tell himself that it if he completely relaxes, all of his work will pay off and he will be funny with Johnny. And in fact that’s exactly what happened. AVC: “Be more yourself than ever. Don’t force,” is what he wrote in his journal before that first Tonight Show appearance. AVC: The doc begins with footage of Garry pulling out the journals and talking to you about them. Was this in the works before he died, or was that for something else? JA: He was not talking to me. I wasn’t there when they shot that. He had been shooting some footage with another documentarian, experimenting with him on a way to use the journals. Garry would consider projects, and I don’t know where he stood with that project, if he would have moved forward with it, but he certainly knew that there was something in the journals that was worth sharing. He also wrote in the journals that he wanted to put a book out which contained wisdom from the journals, so I saw that as a sort of permission to use them since it was clearly on his mind. AVC: Together, the docs are four hours and 17 minutes. Was the plan to go long and have it be a two-parter, or did it evolve in that way? JA: We started working on it before it was even set up anywhere. We always just wanted to do it correctly, and then at some point we realized that it needed to be a two-parter like the Bob Dylan documentary or the Eagles documentary. So I called Richard Plepler, the head of HBO, and I told him that I thought Garry deserved that type of treatment, and he was wonderful about it. He said, “Approach it in whatever way you think it works best. We love Garry here and want to do right by him.” Then when I showed them the cuts, they were thrilled. I love documentaries that are not rushing through their subject matter. I’m the first one to buy Ken Burns’ Jazz sets or watch The Keepers or the Grateful Dead documentary. I feel like Garry’s life and career covered so many decades. You really can’t squeeze it all in under two hours without giving short shrift to everything. I also think, in a way, the documentary is a meditation on his life. There’s real poetry in it, and when you take your time, it becomes an immersive experience. You really feel like you’re living Garry’s life with him, and you’re in his head with him because you’re hearing and reading his journals as you go. AVC: It seems like HBO would be particularly enthusiastic about this, because you’re talking about one of their greatest shows of all time. Even though it went off the air before the sort of “golden era” of HBO began, it’s still one of their signature projects. JA: Well, HBO said that the reason why they went in the direction that they did in terms of the style of their groundbreaking content was because of The Larry Sanders Show. That was the first prestigious, innovative program they had, and it made them realize that that’s what they should be developing. I heard that when David Chase watched The Larry Sanders Show, he said it made him realize what was possible on television now. He said, “Oh, we’re allowed to do this now?” It got him excited to create something like The Sopranos because now there was home for it at a place like HBO. That’s why HBO cares so much about Garry because they feel like he clarified their vision with his work. AVC: Larry Sanders been off the air for almost 20 years. A couple of times in the doc, people mention how Garry had been out of the spotlight for a little while when he died, even though he was doing more stand-up. How much of this doc is an attempt to re-establish how important Garry Shandling was? I’m sure he was inspired by people like Norman Lear and Larry Gelbart and James Brooks before him. I think they were precedents. There was a great show called Tanner on HBO. It was a fictionalized version of someone running for president that Garry Trudeau wrote. I think Garry was a big fan of Woody Allen and Paddy Chayefsky. He also created these shows after NYPD Blue and Hill Street Blues. [NYPD Blue debuted a year after The Larry Sanders Show. —ed.] And I think all of that was part of the soup of his inspirations. But in comedy, he certainly took it to another level, and the quality was so high. He always thought to go as deep as he could go and to be as authentic as possible and we see that in a lot of television today. JA: Yeah, I think that the show was a form of psychoanalysis. Garry was psychoanalyzing himself while he was making this show. The Larry Sanders character is almost a shadow self; it’s everything that Garry didn’t want to be. He didn’t want to be an egomaniac. He didn’t want to be the kind of person that cared about success over human relationships. So I always thought that he was talking about a part of himself that he wasn’t proud of. But he also used to say that he was very different from Larry Sanders because Larry Sanders would never have the distance or the self-awareness to write The Larry Sanders Show. AVC: It is interesting because there’s other great quote in the doc where someone says his “methodology was to fall over the finish line for something.” That even extended to the DVD extras for The Larry Sanders Show, which had all of these intense interviews with cast and guests. JA: I think that the DVD extras were like an art project. He had completed the show, now he wanted to explore the people who made the show and get even closer to the truth and strip away the actual show to the experience and the lives of the people making the show. I remember when he was working on it, I thought, “Why is he working so hard?” [He worked] for over a year on these DVD extras. He was such an innovator. I think he had some instincts about people wanting to know more and go deeper. This was before podcasting, and in a way, he anticipated a new form that we see on podcasts, on Comedians In Cars Getting Coffee. He was wanted to explore human behavior, and that was the logical next stage. It was to take away the fiction. AVC: Were you in regular touch with him until the end of his life? JA: Yeah. I actually talked to him a lot in the last month or so before he died, because he was trying to get HBO to reacquire The Larry Sanders Show and stream it. And in fact, they did do that, and his agent called him to tell him that the deal was closed, and within a few hours, Garry had died. AVC: Peter Berg mentioned that sometimes he’d talking to him toward the end, and Garry seemed semi-lucid, like he wasn’t quite there. He mentions maybe it was drugs in passing, but then the doc goes into his thyroid issue and pancreatitis. Was that your experience around that time? Like he wasn’t quite lucid? JA: It was hard to know. He wasn’t sharing that information with very many people. So there was these rumors that Garry had a face-lift, but looking back, it seems like he’s on prednisone or medication possibly for his pancreatitis or his thyroid conditions. So there were years where sometimes you’d see Garry and he would be hilarious and super sharp, and other times where he seemed spacey, and it was impossible to know what all of that was about. Could he have been on pain medication? Who knows? Because he doesn’t tell anybody. When he passed, there wasn’t anything in his system that would indicate that he was having any problem with anything. But he certainly must have been in a lot of pain. Pancreatitis is a very painful condition, so that was one of the mysteries, was when you would see Garry and he didn’t seem all there, what was the cause of that? AVC: Before his pancreas surgery, he settles his affairs and worked on being at peace with everything. Even though he wouldn’t actually die for a few years, it seemed like he was at peace with leaving. JA: It’s hard to know what was going on in his mind. His surgery he had for his pancreatitis was life-threatening surgery, so he definitely got his affairs in order and writes in his journals about letting go and being open to the idea that he wasn’t going to live much longer. He wanted to live longer, and he lived a few years more, but I think that that surgery forced to confront that head on. A lot of people I interviewed said they had conversations with him in the last few months [of his life] which made them think that maybe Garry had some sense that he didn’t have much more time. But it’s hard for me to know if that’s accurate, because I think when you’ve had a lot of these health problems and you’re a comedian, death becomes one of your jokes. It’s very easy to make that your running gag, and Garry was always very open to talking about the big issues at times. So I didn’t include that in the documentary, because I wasn’t sure the meaning of that. But a few people thought, “This phone call felt like a goodbye phone call.” If you watch Comedians In Cars Getting Coffee, it’s not the first time Garry opens up about his spirituality and does a few jokes about death. So it definitely makes you wonder what was going on in Garry’s mind and if he had any sense of those issues. We’ll never know. AVC: Garry was your mentor, and this is obviously a very very personal project for you. Having so much time with him when he was living and now having dived deep into his innermost thoughts for this projects, what final lessons have you taken from this? JA: Most people never get a sense to read someone’s unedited diaries, so in a way it feels like living someone’s life. It was very intense to read them. I was very happy about who I found him to be. His private thoughts were usually about trying to find ways to heal himself, trying to find ways to not be petty, to forgive, to connect with people, to resolve issues. As he got older, they became about mentoring and growing old gracefully and facing death with dignity and ultimately learning to connect with people and love people purely. So I was very happy to find out that Garry was an even better person than I thought he was, and he was already my favorite person. So what I take from it is what the Dalai Lama says, “My religion is kindness.” And everything that Ram Dass says at the end of the documentary: to live a life of loving awareness. That’s what I hope people take from it. There’s a lot about Garry, but really the movie is a Trojan horse to make you think your own life and how you want to live it and how you might learn to live and love more fully.